Out of the half million dog owners in New York City, hundreds of thousands avail themselves of the Off-leash Hours policy in many NYC parks. Dog owners are the largest single user group in the parks. 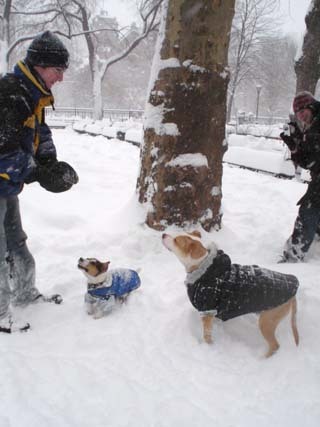 The community spirit, camaraderie, and love for the parks shows in the stories they tell about how Off-leash Hours are a cherished part of living in New York City. As part of the remarkable City Renaissance over the past fifteen years, dog Off-leash Hours have made New York City a better place to live. I moved to Brooklyn, just outside of Prospect Park a little over a year and a half ago. I was concerned about the drastic decline in the quality of life that my one year old pup and I enjoyed out in the suburbs, yet the move was inevitable. How wonderfully surprised I was to find out about the off-leash hours in NYC Parks! I visit Prospect Park every morning before 9am with my dog and I can honestly say that it is the best part of my day and the best part about living in New York City. It is not only a time for my dog to socialize and to enjoy the fresh air and all the parks have to offer, but for myself as well! The mornings in the park with my dog are my solace before heading back into the fast-paced city life. And the friends and acquaintences I have met through fellow dog-ownership in the parks have become a resource for information, help and companionship. I make sure to make regular contributions to Prospect Park because of their commitment to the dog owners and lovers of the community and would continue to do the same in order to ensure that Off-leash Hours are not impeded upon. 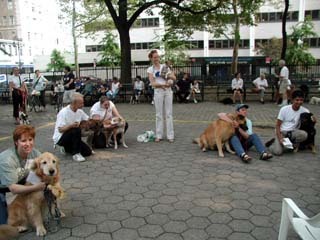 Preserving these privileges makes NYC a better place for dogs and especially their loving owners!" I live across the street from Prospect Park in Park Slope, Brooklyn. Over the years I have brought out of town guests into the park in the am to catch a glimpse of "dog heaven". All of my suburban friends comment that the dogs here are so well socialized with people and other dogs as a result of this fabulous off leash opportunity! We stroll, sip our coffee and watch young and old dogs play freely. This past winter my work hours changed and I was finally able to take a dog into my home! "Ezzy" was a shy little mutt when I got her from the shelter. She is a regular at 6:30 am in Prospect Park now. She is a different dog. I marvel at how so many different kinds of dogs can get along so well. I believe it is in part because of the conscientiousness of my fellow dog lovers. People talk with one another and don't bring dogs that are anxious or aggressive to these free runs. The result is everyone has fun. I look forward to my mornings with Ezzy. I always meet new neighbors and she gets the exercise she needs! Please don't take something away that brings my Park Slope community together! 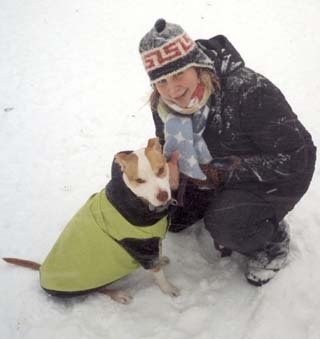 When I adopted my pit bull mix Patti Smith from the AC&C animal shelter on 110th St. in Manhattan, in January of 2003, I thought she was a jack russell terrier. The shelter told me she was a "jack russell terrier mix" and I knew very little about dogs. But the type of breed she was, was not the problem. 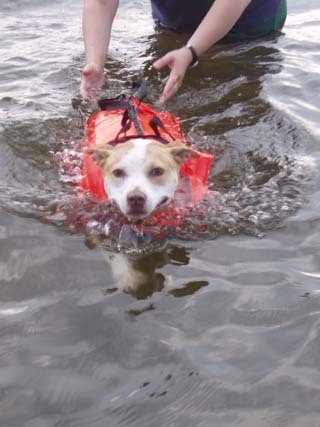 Even as Patti grew out of the carrying bag I purchased for her so I could take her on the subway, even as she went from 15 pounds to 55 pounds in only a few months, and even as I began to realize she was a pit bull mix of some sort, none of these things were an issue for me. The biggest issue was keeping a dog this size in my tiny one-bedroom New York City apartment that I shared with a roommate. I was torn because I had fallen head over heels in love with Patti from the moment I set my eyes on her at the shelter and fought with a couple who also wanted to adopt her. But I also could not see how I could keep her while living in such a tiny space and only being able to walk her on leash. I weighed my options. Should I keep Patti, and move out of New York City, and try to live someplace where we could have a backyard? Should I move back with my parents in Jersey? Was it better for Patti to be with someone else who had grass and trees, and a place to run, where she wasn't being tugged around town with a leash, getting red marks and sores around her neck from her puppy energy? I tried various leashes, collars, and harnesses. I ordered dog contraptions on the internet. I visited half of the pet stores in Manhattan, trying to figure out a solution to Patti's pulling, prodding, tugging, leaping, and constant need to yank, throw, and fling me down the street. I knew that she wanted to run and play like country dogs, and I didn't know what I was going to do with her, our problem, or my life in general. One day that winter, I was walking down the street, nearly in tears, as a woman sidled up to Patti and I with her dog and asked, "Have you been to Stuyvesant Park? We have a quasi dog run there that might help both of you." My heart started thumping faster...could this be? A dog run? I was just getting used to living in New York City, and nobody had told me about Stuyvesant Park. Tompkins Park was great, but it was much further from where we lived, and we were only able to get there a handful of times. An off-leash dog area at a nearby park would be ideal. From the moment I stepped foot in Stuyvesant Park, I knew my life had changed for the better. I opened the quasi dilapidated gates, took off Patti's leash, and watched as she ran with ecstatic delight, sniffing every piece of stone, rock, tree branch, and flower, along with every single dog in sight. I finally felt some relief. I was relieved that my dog had a place to run, free from a leash, free from harm's way of traffic and bicycles and skateboarders and whizzing ambulances and fire trucks, drunks on the street that would hit her, people that found it funny to scare her or feed her their leftover chicken bones and spicy sandwiches, and all those things on the streets that come with the joys of living in a big, overcrowded city. I couldn't tell who was happier about the off-leash dog area, Patti or I. That was nearly 4 years ago. Patti and I visit Stuyvesant 2 times per day, to utilize the off-leash dog hours. This has been our routine ever since that fateful day in January 2003. And I now volunteer at the shelter where I adopted Patti. When people are hesitant to adopt a larger dog because they feel they don't have enough space for a dog that size in their small apartment, I say to them "I bet you can find an off-leash dog run area that will allow your dog to let loose, have fun, and get some exercise." This is often the key to getting them to re-think adopting a larger dog. If they know there is an area for the dog to expel some energy, they are more willing to adopt a bigger dog. And the larger dogs - particularly the pit bull mixes - are constantly euthenized because most people want smaller dogs that don't need as much exercise. 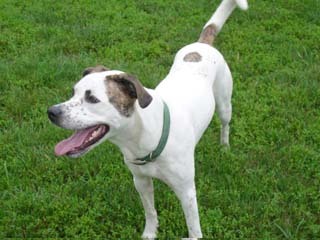 The off-leash dog runs and hours help entice people, and many of these otherwise doomed larger dogs get adopted out. But Stuyvesant is not an actual official dog run. It is an area where we got permission from the Parks Department to put up gates that we ourselves paid for, and we, as volunteers, open and shut the gates in the morning and evening for only a few hours at a time. It would be truly tragic if we lost our off-leash hours at Stuyvesant Park. I don't know what I will do. I certainly won't be frequenting Stuyvesant Park without the Off-leash Hours because of the dodgy things that transpire when the dogs and dog owners are not there. I don't think people are taking into account the fact that dogs and dog owners together actually create a feeling of safety for New Yorkers. I have spoken with people in the park who say that they refuse to walk near the park or sit in Stuyvesant Park until the dogs and dog owners arrive, because "it isn't safe." There are the drug dealers, the indecent flashers, the horrible gang fights, and the creepy lost wanderers. I myself won't walk in with Patti until the off-leash hours are in effect. And once we are in the park with our dogs, the drug dealers move to the park across the street from us, the gangs split up, and people come into the park to drink their coffee in the morning, work on their laptops, and relax. Patients and doctors and nurses from Beth Israel Hospital come to sit and watch as our dogs run and play. Parents bring their children into the park to "look at the doggies." I love New York City and I never want to leave. But I may be forced out of my home due to this lawsuit, because I love my dog too much to watch her lose the ability to run around without a leash attached to her neck. I think it is unfair to the animals to even think about revoking the off-leash dog hours, the only time that our dogs are able to act like dogs, to run and play in a safe environment. And I think that the city as a whole will suffer. The animal shelters will have an even harder time getting dogs adopted, the safety that dogs and dog owners bring to the parks will evaporate, and more people will simply violate the laws by risking fines and allowing their dogs to run off-leash anyhow, in areas not designated for them, which increases the risk of injury for both people and dogs. 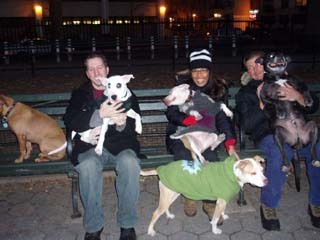 Dog owners help keep the NYC Parks safer at night. 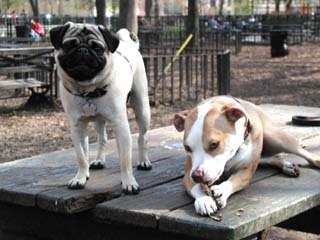 Dog owners are the single largest user group in the NYC Parks, and frequent the parks more than most types of users. Offleash Hours help keep Audry a friendly, well-socialized dog.